Madurai is one of the oldest cities of India, with a history dating all the way back to the Sangam period of the pre Christian era. The glory of Madurai returned in a diminished form in the earlier part of this millennium; it later on came under the rule of the Vijayanagar kingdom after its ransack by the ravaging armies of Delhi (Malik Kafur). During the 16th through the 18th centuries, Madurai was ruled by the Nayak Emperors, the foremost of whom was Tirumalai Nayakar. The Sangam age or the Golden age of Tamil literature  produced masterpieces way back in the Pre christian era and in early 1st millennium CE. Madurai was the seat of the Tamil Sangam or Academy of learning. 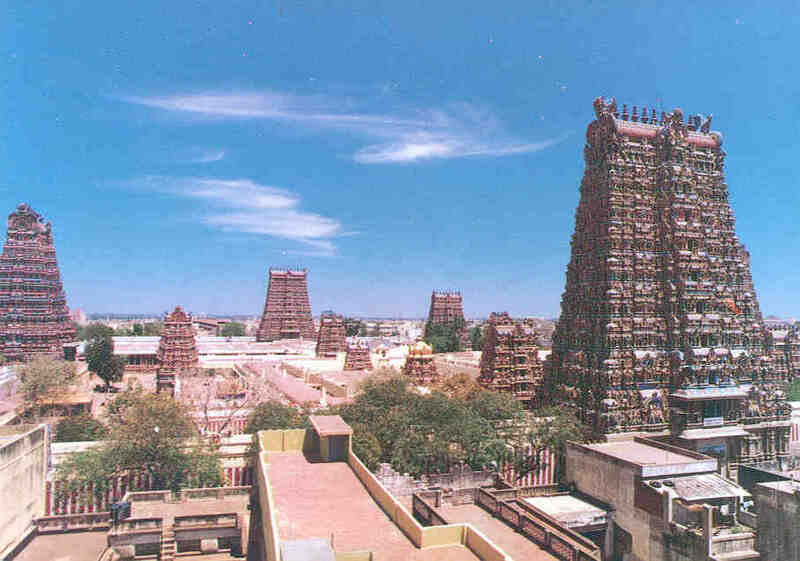 The entire city of Madurai, is built around the Meenakshi Sundareswarar Temple  the temple par excellence. Concentric rectangular streets surround the temple, symbolizing the structure of the cosmos. Popular belief is that Meenakshi (Parvati), is the queen of Madurai, a Pandyan princess known originally as Tatatakai, who married Shiva. The coronation and the marriage ceremonies are still celebrated in a grand manner, that can be compared to the Dussera Parade of Mysore. Meenakshi and Somasundarar are regarded as the eternal rulers of the Pandya Kingdom. Also in Madurai are the Aappudaiyaar Koyil Tevara Stalam and the Koodalazhagar Divya Desam. In the vicinity of Madurai is Tirupparamkunram, one of the 6 padai veedu shrines of Murugan (glorified in Madurai Sangam Nakeerars Tirumurugaatruppadai). Also in the vicinity of Madurai is Alagar Koyil, one of the prominent Divya Desam shrines of the Sri Vaishnavite faith.